The Tucson Limited is pricey, but it's the only way to get navigation and automatic emergency braking. 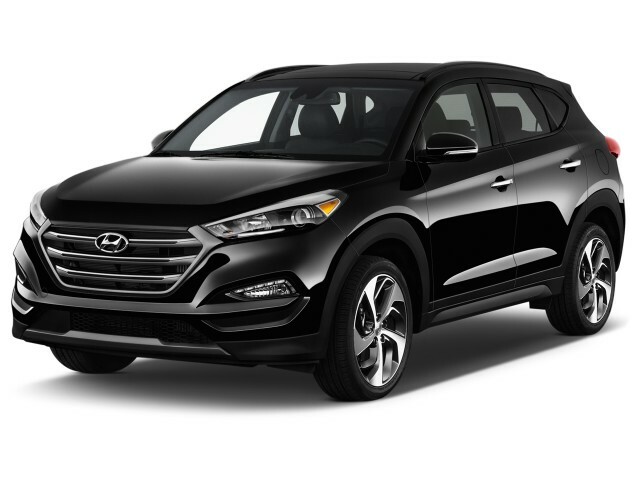 The Hyundai Tucson was recently redesigned for the third time in the compact crossover's history last year, and for 2017 it largely stands pat aside from adding some technology updates inside that are, at least for now, relegated only to the higher-dollar trim levels. 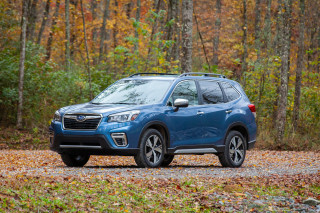 Tucson is available in a variety of flavors that start under $25,000 but can climb quickly with options, although the same comments could easily be levied against rivals like the Toyota RAV4, Honda CR-V, Ford Escape, and Subaru Forester. Tucson is available in SE, Eco, Sport, and Limited trim levels, all of which are offered with a choice of sunny state front-wheel drive or slushy road all wheel-drive. Popping for all-wheel drive adds $1,400 to any trim level. 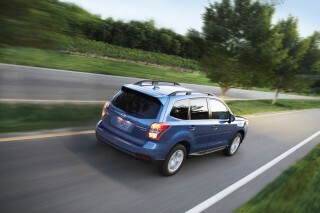 The base SE is the only model to utilize a 2.0-liter 4-cylinder engine with direct injection. Rated at 164 horsepower and 151 pound-feet of torque, the 2.0 won't win any drag races and it is actually the least efficient Tucson powertrain. If your budget allows, we wholeheartedly recommend opting for the Eco, Sport, and Limited trim levels. 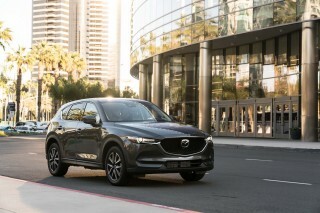 They add a 1.6-liter 4-cylinder engine that although smaller, boasts a turbocharger that boosts power to 175 hp and, perhaps more importantly, 195 lb-ft of torque. 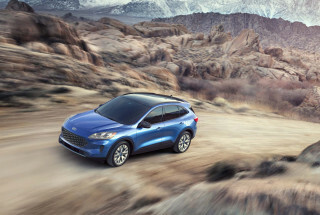 It's that latter figure that helps motivate the Tucson around with confidence, although even it can feel a little pokey around town compared to the larger turbo motors optional in the Escape and Forester. Tuscon SEs utilize a conventional 6-speed automatic, while the other models feature as standard a high-tech 7-speed dual-clutch automatic. 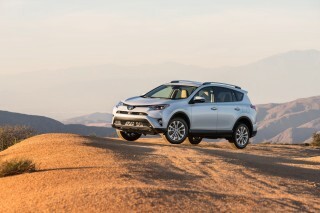 Opting for the optional all wheel-drive adds a driver-selectable lock that splits engine torque between the front and rear wheels for, say, deep snow, but drivers in all weather will appreciate its torque vectoring that gently brakes an inside wheel to improve hard cornering performance. The Tucson's ride and handling is less sporty than its looks might indicate, but this isn't necessarily a bad thing for its target audience. Steering and handling through the twisties are predictable and competent, the ride is refined, and the cabin is quiet at highway speeds. 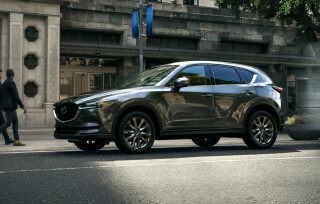 If you want your performance kicks, the Mazda CX-5 and Subaru Forester 2.0XT should be on your shopping list instead. On the other hand, the Tucson's cabin is roomy enough for four adults to sit in comfort. Rear seat passengers are treated to good leg room and a reclining seat back. Cargo space is up, but still doesn't match that of some competitors. However, added versatility comes by way of a cargo floor that can be lowered by 2 inches for easier loading of heavy items. Sport and Limited Tucsons offer a power liftgate that can open automatically if the key fob is in your pocket and you stand near the rear of the vehicle. That's a nifty solution, but we still prefer systems that sense a user's foot under the rear bumper. For 2017, Hyundai has updated the Sport's interior with the nicer materials previously relegated to the Limited, but the SE's inner trappings are lined with lots of hard plastic trim. Regardless of trim level, all Tucsons feel well assembled. The entry-level SE, predictably, is the most modestly equipped, but even it includes as standard a few delights like alloy wheels, Bluetooth, satellite radio, and a 5.0-inch color touchscreen audio system. Two option packages—Preferred and Popular Equipment—add items like LED running lights, roof rack rails, and a single touch feature for the power windows. Stepping up to the Eco nets the small turbo motor most of what's in the Preferred and Popular Equipment packages on the SE, as well as special aerodynamic wheels and low rolling resistance tires that improve fuel economy by as much as 2 mpg. The Sport, meanwhile, doesn't actually add anything that lives up to its moniker, but it does include 19-inch alloy wheels, a proximity key that works with the aforementioned power liftgate, heated seats, blind-spot monitors, and rear cross-traffic alert. The range-topping Limited builds on the Sport with leather seats, an 8.0-inch touchscreen navigation system, Android Auto, and Apple CarPlay. The Limited is also the only Tucson available with automatic emergency braking, which means it is the only model to qualify as an IIHS Top Safety Pick. One thing we'd like to see from Hyundai is expanded availability of automatic emergency braking and navigation to models other than the Limited. Most rivals now offer those features at a much lower price point. On the safety front, the Tucson earns top five-star frontal and side impact results from the NHTSA, and the IIHS has given a Top Safety Pick award to Limited models with the optional automatic emergency braking. The Hyundai Tucson makes few waves inside or out, but it is a clean and upmarket-looking crossover. The latest Hyundai Tucson looks more conventional than before, discarding its predecessor's busy design for a clean, sculpted presence that should be familiar to anyone who has looked at a Hyundai crossover in the last few years. The Tucson shares most of its styling elements with its big brother, the Santa Fe. A short greenhouse, a hexagonal grille design, and sharply geometric headlamps fit in with Hyundai's current design language. Base SE models have alloy wheels and lack few of the styling features seen on higher-trim models. It takes stepping up to the Tucson Sport or Limited to gain a more dynamic design by way of black and silver-finished 19-inch alloy wheels. This upscale feel continues inside where Hyundai's designers have put together a conservative, but highly functional dashboard. Classy touches like stitched trim atop the instrument binnacle set the Limited apart. The Tucson's interior is elegant in its simplicity, thoughtfully laid out, and facilitates an excellent view of the road ahead thanks to relatively narrow roof pillars. Seat design with thick bolsters adds to the upscale look, particularly when upholstered in leather in the Limited. One demerit worth mentioning is the relative button heaviness of the Tucson's interior. Although its controls are logically arrayed, with climate and infotainment switches separated by a fair amount of real estate, most switches are about the same size as one another and might be challenging to discern at first glance. The Tucson has a nice ride, but its steering is lifeless and even the turbo feels a little underpowered. Tucson buyers have two choices to make: Engines and drive wheels. The base SE is the only trim level powered by a direct-injection 2.0-liter inline-4 that makes 164 horsepower and 151 pound-feet of torque. It's mated to a traditional 6-speed automatic transmission, and it sips fuel at a faster rate than the other engine on offer. The Eco, Sport, and Limited, meanwhile, all utilize a more sophisticated direct-injection 1.6-liter turbocharged inline-4 paired with a 7-speed dual-clutch transmission (DCT). This powertrain is rated at 175 hp and 195 lb-ft of torque, the latter of which comes on pretty low in the rev range. We've spent more time behind the wheel of the turbocharged Tucson and can report that it is adequately powerful and that its 7-speed gearbox shifts nearly imperceptibly. With a full load of passengers or cargo aboard, however, the turbo runs out of steam and feels surprisingly sluggish. Hyundai does offer three driving modes—Normal, Eco, and Sport—but they don't make it any faster. Interestingly, the SE feels less hesitant right off the line, a virtue perhaps owed to its conventional automatic. However, the difference becomes apparently quickly since the turbo inline-4 simply has more power to give. The Hyundai Tucson makes good use of its interior space, but there is no denying that some rivals offer more cargo room. We like the Hyundai Tucson's interior look and feel, but it isn't quite as roomy inside as some larger rivals. Updates for 2017 have brought nicer interior trim quality to the Sport model's door panels. The Tucson's front seats are well-bolstered and comfortable on longer drives, regardless of model. Power adjustment for the driver's throne is standard on all Tucsons except the SE. Because sporty exterior design necessitates higher window sills, the passenger seat is height-adjustable, a relative rarity in this class. Only Limited models get power adjustments for the passenger, though. The Tucson's rear seat will comfortably seat two adults, even when front seats are adjusted for taller drivers and passengers. It reclines easily with the use of a lever like one you'd find on a front seat, but the term "recline" may be somewhat misleading—you can adjust its rake, yes, but we found that its forward position felt nearly vertical, while its rearward position seemed normal. Dash design and control layout are superb regardless of trim level. The instrument cluster features straightforward analog gauges on either side of a digital information center that's refreshingly free from gimmicky graphics. The center console strikes an excellent balance between old and new, with buttons for primary functions and a touchscreen for ancillary commands. Material quality varies, though. Opt for a top-spec Limited and you'll find soft-touch trim, leather seats, and an available panoramic moonroof that give the interior a decidedly upmarket look and feel. The entry-level SE model, however, gives off a different impression. Its design is still good, but nearly every surface that's soft-touch in the Limited is covered in hard plastic trim instead. You'll also need to splurge on the Limited if you want the 8.0-inch touchscreen—there's a 5.0-inch variant on other Tucsons. There's 30.1 cubic feet of cargo space with the 60/40-split folding rear seats up, and 61.9 cubic feet when they're folded. It looks very usable, but this is still substantially less room than you'll find in most of the Tucson's direct competitors. There is some nifty versatility in a cargo floor that can be lowered by 2 inches to accommodate taller items; buyers who don't mind a slight lift-over when loading and unloading might simply leave it in the lower position. The Tucson performs very well in crash tests, but we'd like to see its latest safety features at a lower price. The Hyundai Tucson has earned top-notch crash-test scores in almost every evaluation: top five-star frontal and side impact results from the NHTSA, as well as Top Safety Pick status from the IIHS. The IIHS says it is planning to implement a new test in a few years designed to measure front passenger crashworthiness in the same frontal offset evaluation it currently uses to evaluate driver safety. Of more than half a dozen crossovers informally tested by the agency recently, the Tucson was the only one to provide the same, high level of protection for the front seat passenger as the driver. Since IIHS has not formalized this test, we don't currently factor it into our safety score. However, it is important to note that only the Tucson provided was essentially amounts to a symmetrical safety cage. Advanced safety features are reserved for trim levels with starting prices around $26,000. Sport and Limited models get blind-spot monitors, lane change assist, and rear cross-traffic alert. 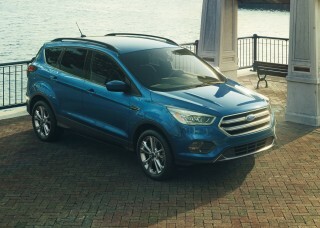 The optional Ultimate Package for the Limited features the aforementioned automatic emergency braking with pedestrian detection, lane-departure warnings, and backup sensors. There isn't much customizability with the Hyundai Tucson, but a loaded Limited is exceptionally well-equipped. The Hyundai Tucson leans on its nameplate's reputation for value, and it delivers. Base crossovers come with a good deal of standard equipment. The trade-off? 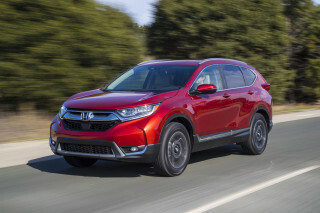 There are few choices once you've locked into a trim level, and only the Limited model offers anything really distinctive in terms of options. On the standard Tucson SE, Hyundai fits its normally aspirated inline-4 and a 6-speed automatic. There are the usual power features, cruise control, and air conditioning, along with nice touches like automatic headlights, a rearview camera, a 5.0-inch touchscreen for its infotainment system, and a tilt/telescoping steering wheel. Base Tucsons also get beige cloth upholstery that resists odors and stains. Standard and optional equipment is otherwise fairly basic, with few surprises. A few cosmetic details add up to the Tucson SE trim package. The Eco adds to the SE a direct-injected 1.6-liter turbocharged inline-4 that's matched to a 7-speed dual-clutch transmission. Like the SE, it wears 17-inch wheels. Next up is the Sport trim that builds on the Eco's specifications with 19-inch wheels, keyless ignition, a variety of driver assists, and heated front seats. The Sport also gets an innovative feature that opens the liftgate automatically when the key fob has been in proximity for three seconds. It will work only if the Tucson is locked, and the range of its motion can be programmed to avoid hitting, say, garage doors. The Hyundai Tucson earns EPA ratings of up to 29 mpg combined, but the high-volume model is rated at 26 mpg. 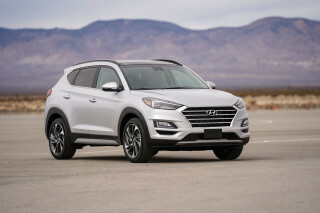 The Hyundai Tucson crossover SUV has lifted its fuel economy game with fresh powertrains and a new transmission on the most expensive models. Base Tucsons get a 2.0-liter inline-4 with 164 horsepower. Coupled to a 6-speed automatic, this version is rated at 23 mpg city, 30 highway, 26 combined with front-wheel drive. All-wheel drive trims fuel economy to 21/26/23 mpg. 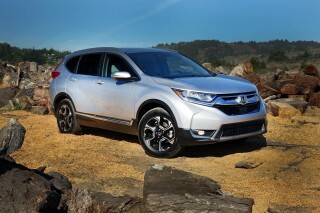 With an EPA rating of 27/33/29 mpg, the 1.5-liter turbo-4 Honda CR-V easily outpaces the South Korean crossover. Other versions of the 2017 Tucson come with a turbocharged 1.6-liter inline-4 with 175 hp, coupled to a 7-speed dual-clutch transmission. Sport and Limited versions are rated at 25/30/27 mpg, while the Eco is rated for 26/33/29 mpg. Hyundai attributes most of the difference between those trim levels to wheel and tire sizes. All-wheel-drive versions of the turbo engine manage 24/28/26 mpg or 25/31/27 mpg in regular and Eco versions, respectively. I have been fighting with Hyundai for over a year regarding my 2017 Tucson. My car will loss power and keep me delayed in the middle of traffic until it picks up power again. Hyundai said it is "As Designed" I... I have been fighting with Hyundai for over a year regarding my 2017 Tucson. My car will loss power and keep me delayed in the middle of traffic until it picks up power again. Hyundai said it is "As Designed" I say, What the heck?? So, Hyundai built a car that would loss power, putting everyone in danger?